I’m really excited about this piece I get to share with you today. 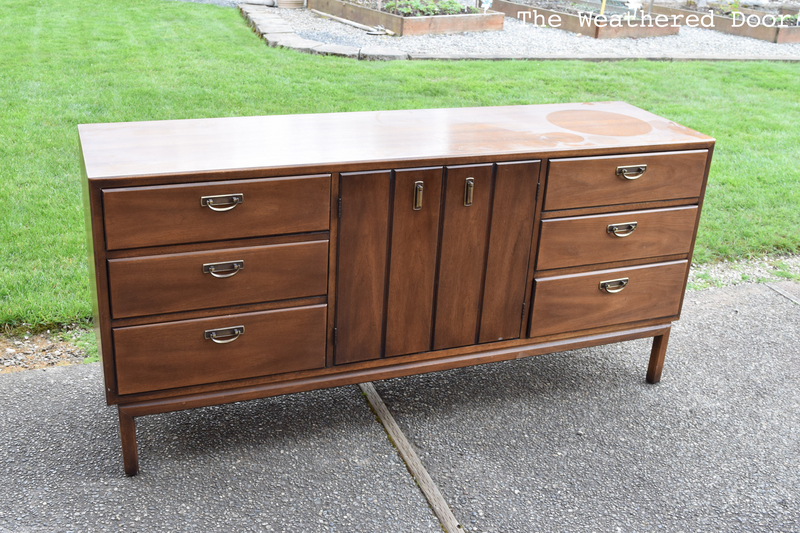 I feel like I have come full circle with this Broyhill Premier credenza from the Modern Classic line. I did the same piece (except the 72″ version, not this 66″ version) in high school. It was one of five pieces I did for my senior project which is what started this blog… 3 years ago! You can check out the first one I did here, but don’t laugh 😉 Here is how this current piece was looking, very brown. 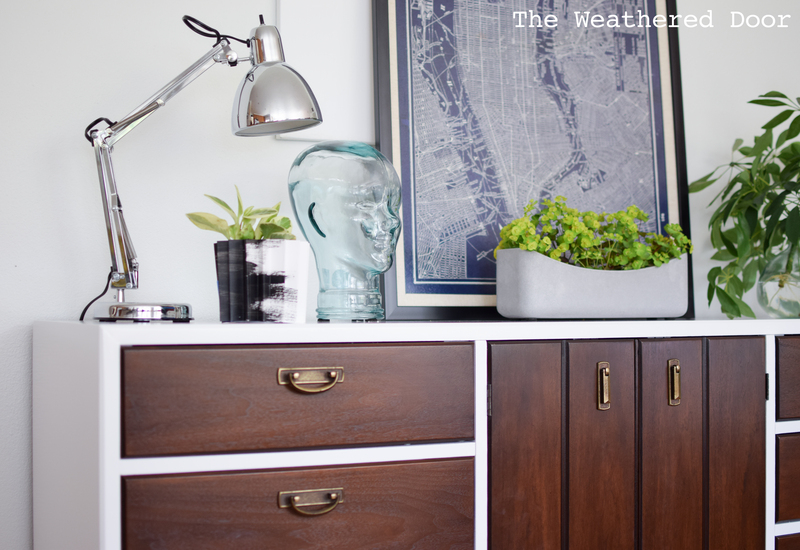 I’m happy to say this piece was is far better condition that the first credenza I did. No broken off front leg and terrible stains on the top, just a few light stains, one deep scratch (through the veneer) and a scratched up left side. This piece came off of craigslist and had been in the previous owners storage unit for a while. When I went to pick it up I saw that it was stored standing on it’s left side in order to fit in the storage locker. The lady then proceeded to pull it out, sliding the whole side against he concrete floors and totally scratching it up. We stood it up on it’s legs, I assessed the damage and then offered a lower price than the price we had already agreed on. You better believe I wasn’t paying full price after that. I considered all options for this piece. 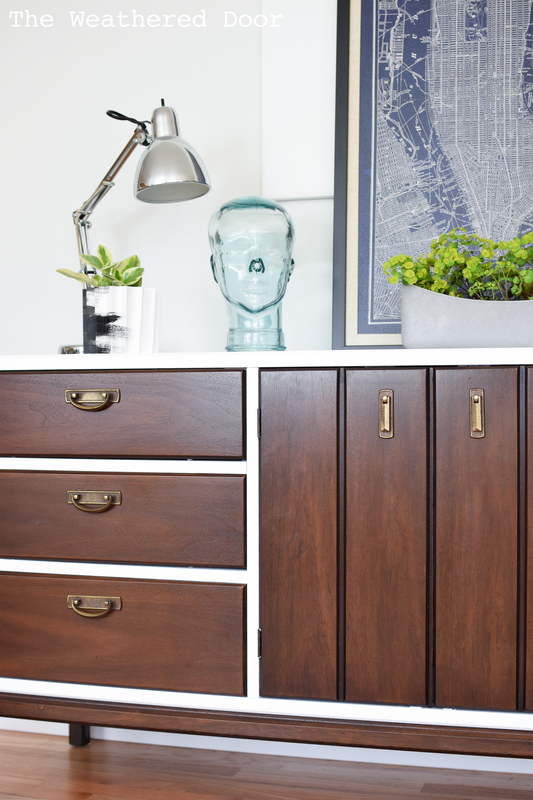 A full refinishing, a bold color all over, and a two tone look. The piece is modern, but it doesn’t have that mid century look, so it needed some paint to modernize it a bit. 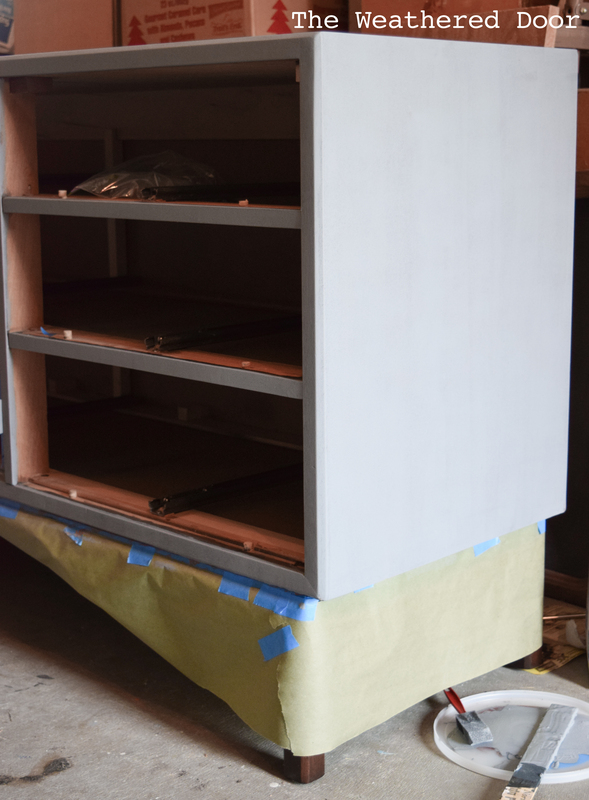 The frame/case was all continuous (no top that had an overhang to act as a place to stop the paint like with this credenza) so the top, sides, and dividing pieces between the drawers were all getting painted. Before getting around to the priming and painting I started with the staining. I did consider stripping all of the drawers and the base, but the old finish was in great shape and it just needed some darkening to make the wood look richer. 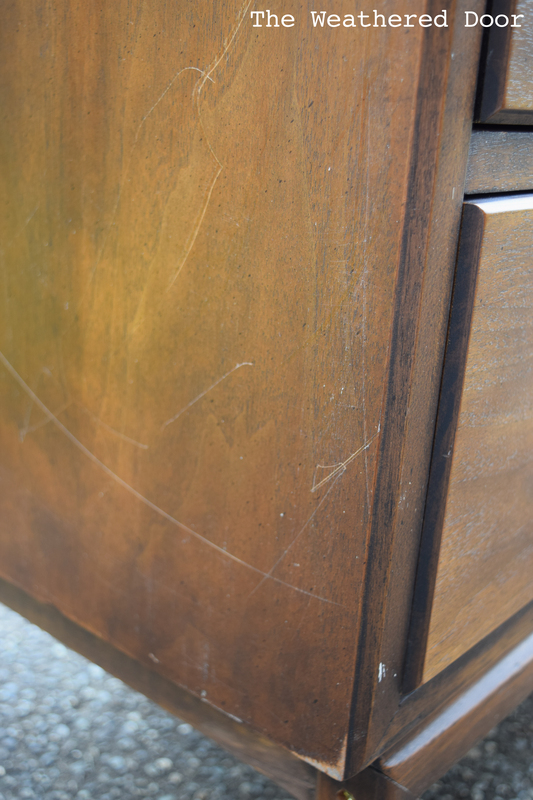 My experience with Broyhill pieces from the 70’s is the old finish (poly, or whatever sealer was used) is usually worn off. In order to be able to stain I still wanted to sand any of the remaining topcoat off so the stain could soak into the wood. I did my wet sand, dry sand, gel stain technique. Read about how to use gel stain over an existing finish without stripping here. I first started with a coat of Rustoleum’s Ultimate Stain in ‘Dark Walnut’ and let it dry for 24 hours. It wasn’t as dark as I had hoped so I then applied one coat of General Finishes gel stain in ‘Java’. After 24 hours of letting the gel stain dry I sealed the drawers by brushing on General Finishes High Performance Topcoat in satin. I did this on all 9 drawers, the 2 cabinet doors (front and backs) and the base/legs. Here’s a video showing how too apply Gel Stain over an existing finish. Once the stained areas were sealed and dry I taped off the base, removed the drawers and began prepping the frame. I filled all of the holes, dings, and gouges on the frame with my favorite filler – Bondo glazing putty – and sanded it smooth (some areas needed to be filled twice and sanded smooth). The whole frame was sanded with 150 grit sandpaper. At this point I decided I wanted to add something fun to the piece. 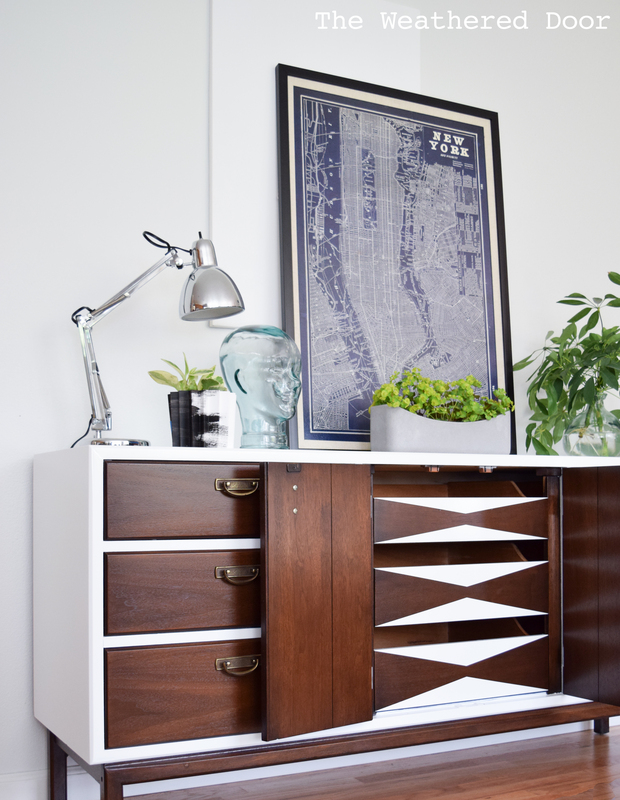 The white and walnut look is great, but I’ve done it before and so have many other people. 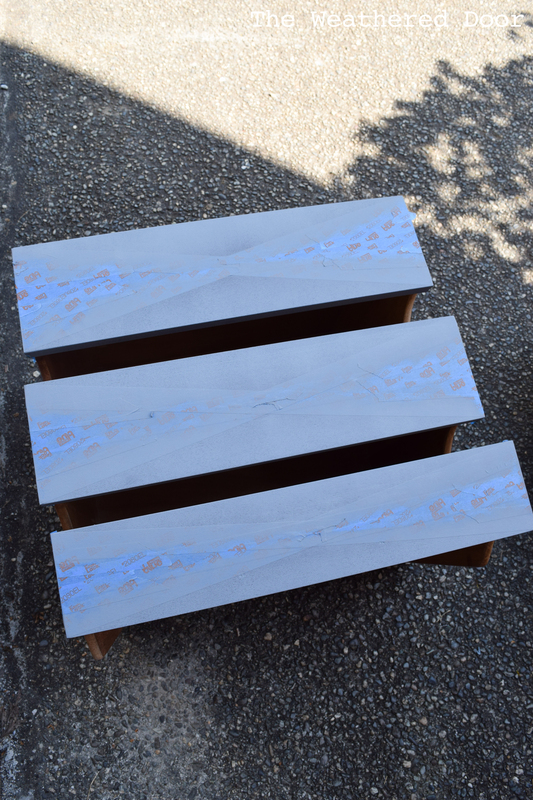 You probably know I love geometric designs, so I decided to add a geo pattern to the 3 drawers in the center. It would be a fun way to make the piece unique but wasn’t something that would have to be seen all the time since the drawers are hidden by the cabinet doors. 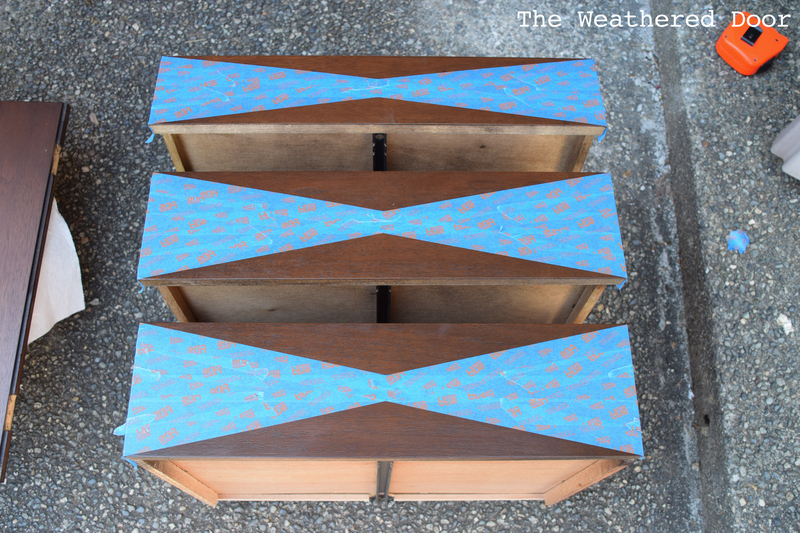 I measured and taped off the pattern on the 3 drawers, then used my handy dandy trick to get perfectly painted lines. Just like the frame of the credenza I lightly sanded the areas of the design that were to be painted with 150 grit sandpaper to rough them up a bit and the give the primer something to hold onto. Next I rolled on 2 coats of Zinsser Cover Stain primer to the frame and the 3 interior drawers where the geometric design would go. I had my can of primer tinted grey a while back so that’s is what I used. A simple foam roller did the trick. It does leave a funny texture so once it had dried I sanded with 220 grit sandpaper to smooth out the finish. After primer I moved the dresser and 3 drawers into my spray booth. When painting pieces I lay them down on saw horses to easily paint the tops and sides. I used a poster board to prevent overspray when painting the cross bars between the drawers and when painting the drawers to keep the insides clean. The legs and base were also taped off with paper. I tried a new type of paint for this piece. 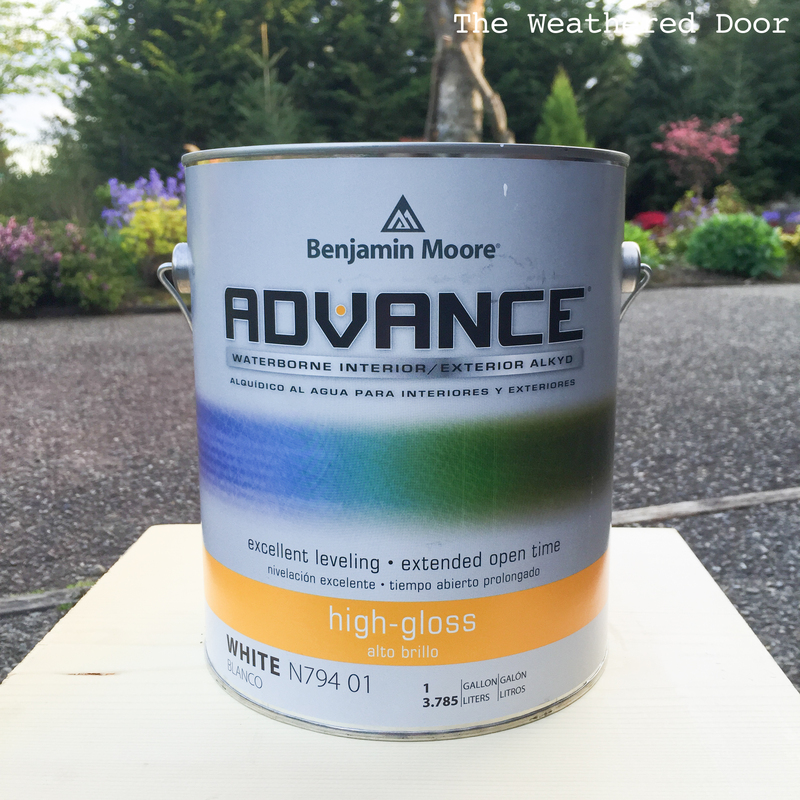 I sprayed on Benjamin Moore’s Advance Alkyd paint in High Gloss. If you want to hear my thoughts and experience and how it compares to what I normally use (General Finishes paints and topcoats) click here. It covered well, I ended up spraying on 3 coats (which is better than the 5 or more I usually have to brush on when painting a piece white). It looked great after 2 coats but there were a few spots that were a little thinner and since I had used grey primer I went for the third coat. This paint cleans up with soap and water but acts like an oil based paint (the paint lady told me it’s made out of vegetable oil). It does require 16 hours in between coats (dry in 4 hours, but the re-coat time is longer). I also sanded after each coat with 320 grit since the paint was high gloss and I wanted each coat to stay on and be durable. 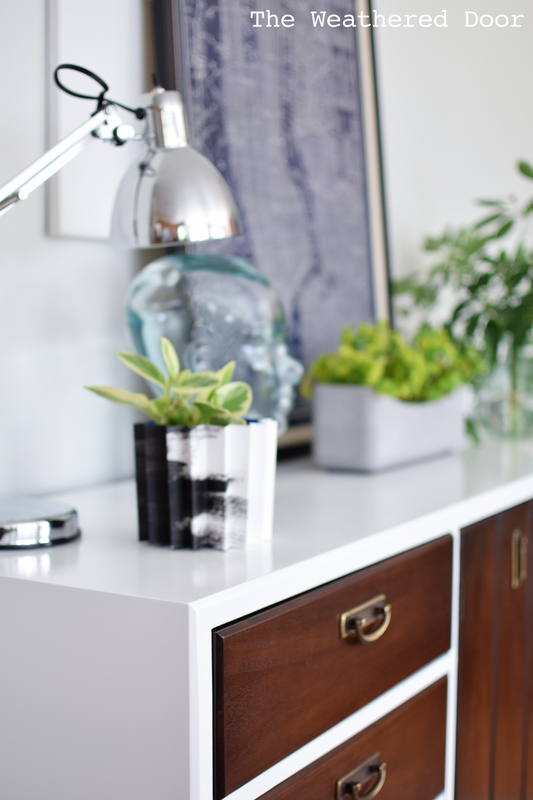 If you want to read about how I started spraying furniture, and which tools I use, click here. I talk about my spray booth, HVLP gun, compressor and air filter. Once the third coat of paint had partially dried I removed the tape on the drawers and from the base of the piece (as well as the hinges and around the center cabinet area where the geometric drawers go). BM’s Advance does need time to cure before use. I happened to be too busy with classes and work to have time to stage and photograph the piece, so it has been finished and curing for 2 weeks and the finish was not tacky and had a nice sheen. 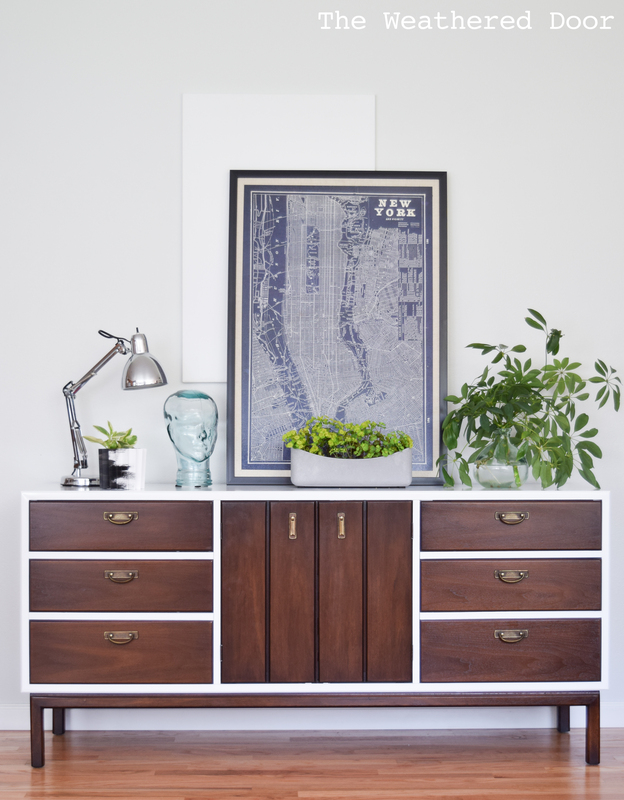 You can find a video on staging this credenza here along with a list of the items used. 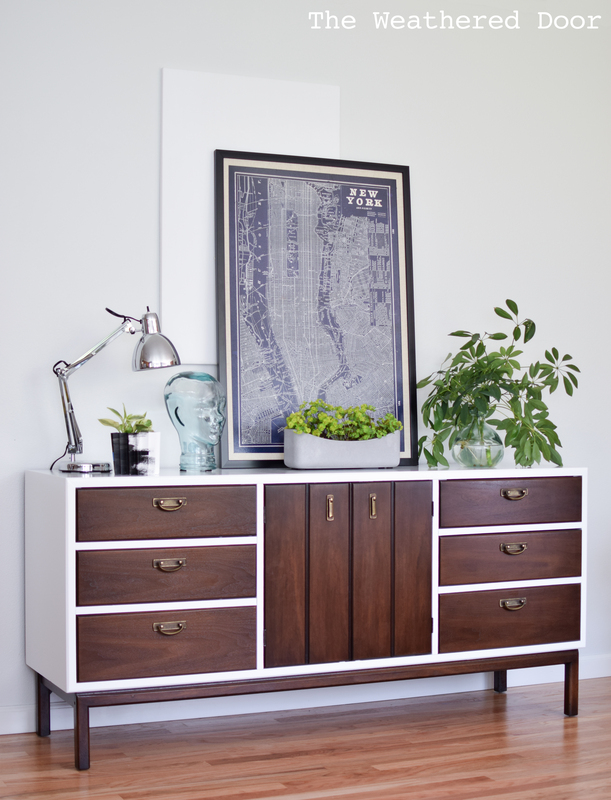 And now, here is the credenza all Fresh and Modern! Very lovely work! Thanks too, for sharing your process and products. I appreciate learning from others' failures and successes (though successes primarily!) and this, in my opinion, is a prime example of furniture success! Reeves, this is definitely one of your best. 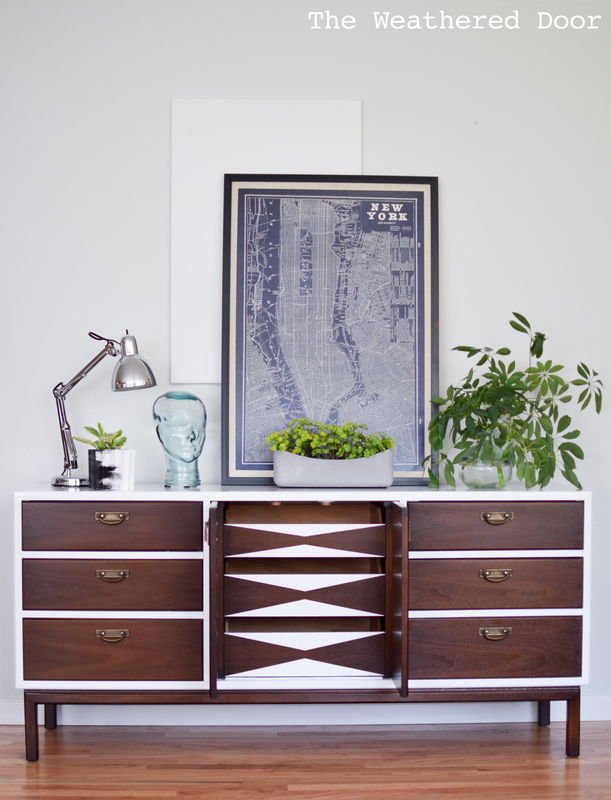 It is scaring me how much I am gravitating toward MCM style furniture lately. Love this! Would you comment as to what spray painter you use, if you thinned the Advance and what type spray booth do you use? I admire your work so much! Thanks, Gilly! I guess sometimes other people don't value furniture as much as we do 🙂 And withholding or not mentioning problems is no fun! Thank you! Yes, I had success with this one, which is nice 🙂 I have learned a lot in my few years of painting and refinishing furniture. Glad you found this post helpful! I mentioned some general info on my sprayer and compressor in this post, but I do have a post started and that I hope to finish and post soon giving all the details on the tools I use and as well as the ones I tried and didn't have such a great experience with. Quickly to answer those questions I used a Husky HVLP composite sprayer, a 25 gallon air compressor and I did thin the BM Advance paint with some water. I will go into details on the settings I use (psi, gun settings) and share how I dilute the paint, help it dry, get an even finish, etc. I just want to make sure I include everything and get it in a blog post so I can point people to it when they want to learn about what I use. I've already had many questions and emails on it so I know it's something people would like to know more about. 🙂 Thanks for reading, Jen! Love the piece! LOVE IT! I am looking forward to the post on your spray techniques! I am also wondering about your spray booth?? I want to create one, but all the tutorials seem super complicated …. again, love the piece! Love it. You have a new follower with me! Came over from Mariam's at MMS. Great work! Hi Reeves, RB here, your post came at a good time as I am currently thinking of upgrading my spray system. I have been using the Critter for about a year now, and overall it is a great little, user friendly device, however it does have some limitations. The biggest I find is that you get such a small spray radius. Spray the top of a piece like the one you just posted about involves a lot of passes in order to cover. I bet a better sprayer has a larger spray radius so it would be a quicker job. One great thing about the critter is that it can be pushed by an 8 gallon compressor like mine, but YES, the thing runs the entire time you are spraying in order to keep up. Anyways, thanks for the details about the Husky, I will be looking into it. Did the two tone make it dated? And if so did you have to end up re-doing it? This turned out really beautifully. I have been wanting to redo an older piece of furniture but I just don’t know if I have the patience. 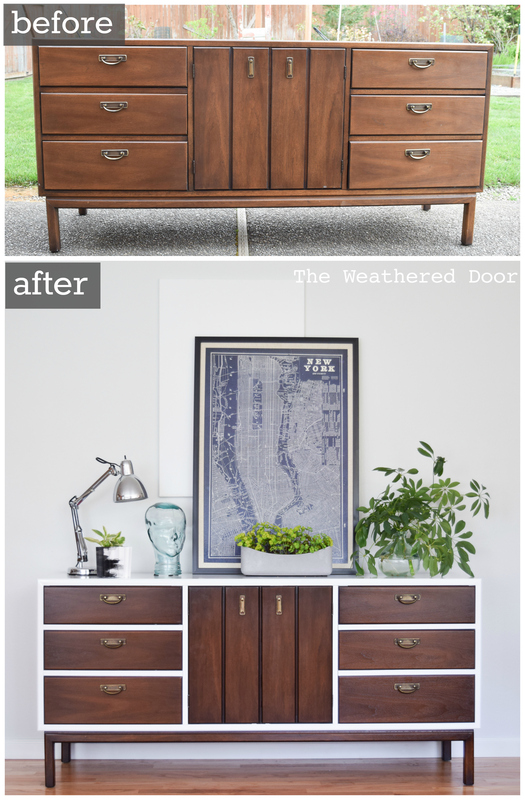 I normally cringe when someone paints over lovely wood, or mid century furniture but this make-over put so much life back into this! I love it. Well done!!! Thank you for this tutorial and the finished piece is beautiful! I have a dresser that I would like to gel stain without stripping but there are a few dings on it, I was wondering if this would work or if painting it would be a better option? Thank you!